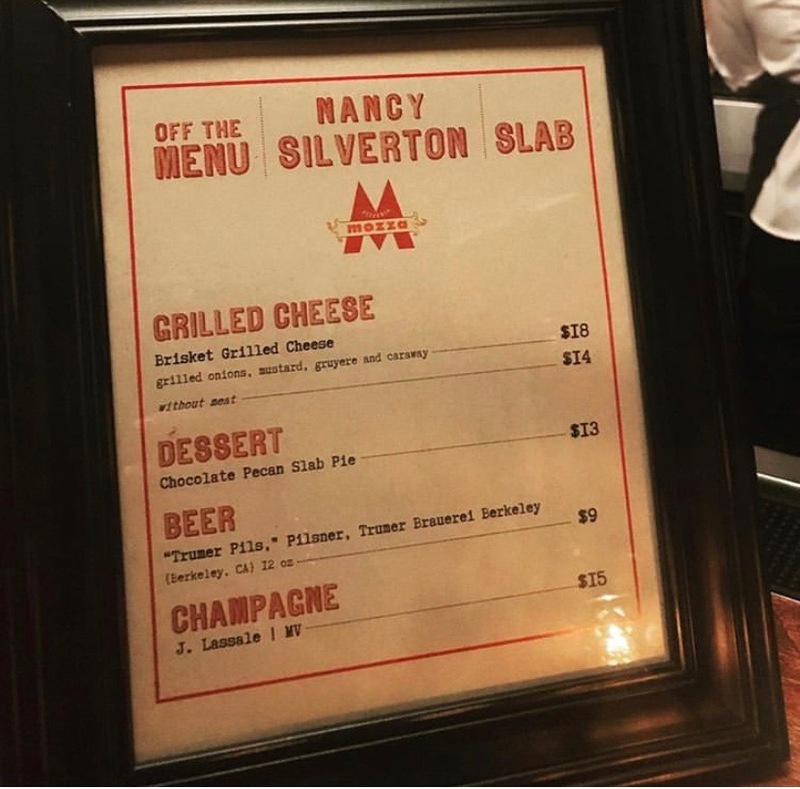 A couple weeks ago Pizzeria Mozza teamed up with SLAB and Nancy Silverton to unveil an epic grilled cheese collaboration. Nancy Silverton’s new late-night menu at Pizzeria Mozza includes five grilled cheeses. The grilled cheeses are available at Pizzeria Mozza’s bar from 10 p.m. to midnight Sundays through Wednesdays, You can also get them all day on Thursdays. The menu kicks off with the classico, also known as “Caryl’s grilled cheese”. Caryl Kim, a friend of Silverton’s who helped her launch Campanile’s grilled-cheese nights back in the 90’s). The classico is an old favorite that has gruyère, onions, and whole-grain mustard. Nancy Silverton is updating the sandwich by sprinkling caraway seeds on the outside. She got the idea after a joint event at Pizzeria Mozza a couple weeks ago, when she added caraway seeds to grilled cheeses made with brisket from Burt Bakman of Trudy’s Underground BBQ and Slab. Who said Instagram didn’t bless us with anything? The menu’s other delectable grilled cheeses are the signore and signorina. These two are Silverton’s versions of a croque monsieur and croque madame, made with prosciutto cotto. There’s also Ruth’s grilled cheese, a sandwich with white cheddar, scallion, shallot, horseradish, and the option to add bacon (always yes to bacon). Finally there’s an open-faced option topped with a riff on pimento cheese that includes smoked gouda, cheddar, and peppers, with pickled celery and fried celery leaves which makes it delectable. Meet you at Pizzeria Mozza Bar every Thursday.